Royal ROY SUP 2 Shrimp Cocktail Paneled Cup 4 oz. 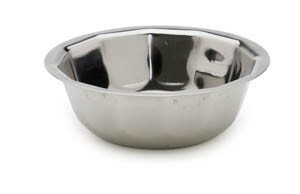 TigerChef > Tabletop > Tabletop Serveware > Salad Bowls and Serving Bowls >< Supreme Bowls > Royal ROY SUP 2 Shrimp Cocktail Paneled Cup 4 oz. $2.89 Royal ROY SUP 1 Shrimp Cocktail Lower Bowl with Gadroon Base 16 oz. A great addition to any restaurant, hotel, or outdoor gathering, the Royal ROY SUP 2 Shrimp Cocktail Paneled Cup 4 oz. is an attractive piece of dinnerware for serving your shrimp cocktail. Stylish and functional, this paneled cup can be combined with a base and ring frame to keep the shrimp in place. Made from stainless steel, this paneled cup is rust resistant and will withstand years of use. This versatile paneled cup can also be used alone for serving ice cream and other desserts. Shrimp Cocktail Paneled Cup 4 oz.